When members of the founding generation protested against British authority, debated separation, and then ratified the Constitution, they formed the American political character we know today-raucous, intemperate, and often mean-spirited. Revolutionary Dissent brings alive a world of colorful and stormy protests that included effigies, pamphlets, songs, sermons, cartoons, letters and liberty trees. Solomon explores through a series of chronological narratives how Americans of the Revolutionary period employed robust speech against the British and against each other. 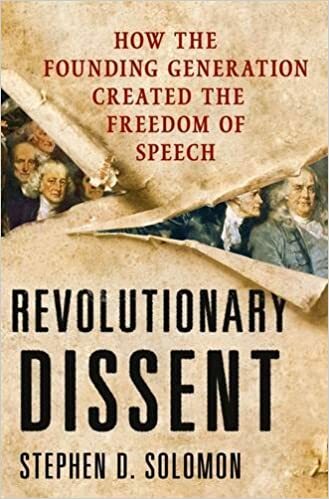 Uninhibited dissent provided a distinctly American meaning to the First Amendment's guarantees of freedom of speech and press at a time when the legal doctrine inherited from England allowed prosecutions of those who criticized government. Solomon discovers the wellspring in our revolutionary past for today's satirists like Jon Stewart and Stephen Colbert, pundits like Rush Limbaugh and Keith Olbermann, and protests like flag burning and street demonstrations. From the inflammatory engravings of Paul Revere, the political theater of Alexander McDougall, the liberty tree protests of Ebenezer McIntosh and the oratory of Patrick Henry, Solomon shares the stories of the dissenters who created the American idea of the liberty of thought. This is truly a revelatory work on the history of free expression in America.